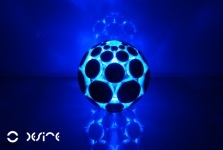 The first models of the new electronic musical instrument the AlphaSphere ‘elite’ will be dispatched to locations all across the world this week. The Bristol based developers, nu desine, have been taking pre-orders since April 2012 based on interest which was generated by a production prototype being demonstrated at a trade fair in March 2012. Though one third of the AlphaSphere elites will stay in the UK, the rest are shipping to locations as far apart as the USA, Europe and Japan. The rapidly growing company have now initiated full production of the first several hundred units, in order to fulfill a second round of orders. Amongst the first elite musicians is Mercury award winning composer Talvin Singh, who described the AlphaSphere as “An incredible universe of an instrument which gives you the feeling to tailor-make tones, aesthetically and sonically, as well as allowing you the capacity to invest in more indigenous and rebellious scale systems.” Talvin who this year is releasing his first new solo album since the acclaimed ‘OK’, first met the team behind the AlphaSphere in late 2012 at their site at Bristol’s harbourside as part of a user testing program. This ‘elite’ production run has taken place entirely in Bristol, though components have been sourced from across the world. The company is now transferring the production process to a facility in Hartlepool, which has a higher capacity than their Bristol HQ. nu desine are located within the Pervasive Media Studio and also members of the Bristol SETsquared Centre and are a good example of the creative and technology sector in Bristol creating exciting new products.